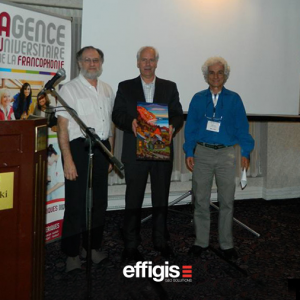 At the Quebec Remote Sensing Association (AQT) Congress held in Rimouski in late September, the outgoing president of the Association, Mr. Alain Royer, was awarded an honorary prize (Ferdinand-Bonn prize) to Mr. Pierre Vincent, Executive Vice-president of Effigis. This price is in recognition of Mr. Vincent contribution to AQT activities as well as advancing and maintaining the dynamism of the discipline in the province of Quebec. Congratulations to Mr. Pierre Vincent! From left to right: Pierre Larouche, Fisheries and Oceans Canada, Pierre Vincent, award winner & Alain Royer, AQT president.